The flat piece is made out of a stacking of three layers and is inspected by the coil described previously. The first and the third ones, both of 2 mm thickness, are from the same aluminium alloy. They are separated by a very thin dielectric layer of 0.07 mm thickness. 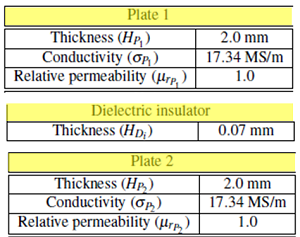 Figures below describe the inspected piece and the features of its constituting materials. The first plate contains same flaws as the plate inspected in the case 1, that means a notch and a flat bottom hole. In the third plate is machined a flat bottom hole identical to the one of the first plate and exactly superimposed to the latter, as shown on figure below. 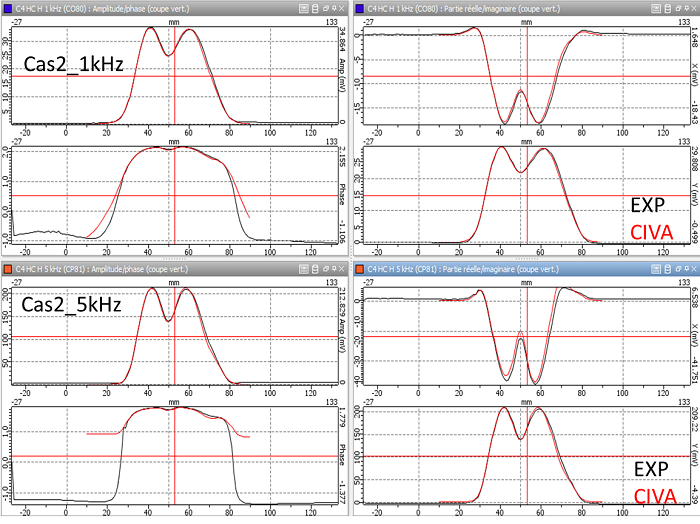 Finally, the table below gathers ampltudes and phases values and confirms the very low gap between experiment and simulation, less than 1 % in amplitude and 0.5° for the phase.